Shivas Trishul (Trident) is the main weapon possessed by Shiva – The lord of destruction and along with the “Damroo” (small drum), is considered to be the most powerful weapon in Hindu Mythology/Vedic History. It is said to have been carved out from the matter directly obtained from the Surya or the Sun god. Symbolically, Shivas Trishul is polyvalent meaning it has a number of different forms, purposes, meanings and aspects like it represents the three aspects of consciousness – waking, dreaming and sleeping. It also represents the three Gunas – Satva, Rajas and Tamas. 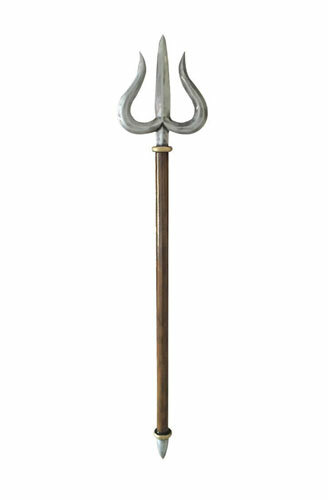 Holding a Trishul (Trident) signifies that Shiva is above all the three states – waking, dreaming and sleeping. 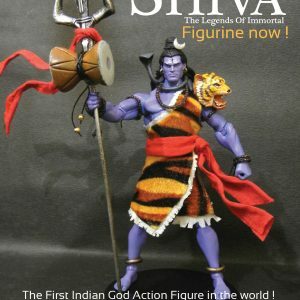 Crafted by one of the best craftsmen in India based on Shiva The Legends of the Immortal national bestselling Graphic Novel series by Vimanika Comics, this Trishul is made of Latex rubber and with a length of 129 cm and weighing about 1 KG is a perfect rendition of the trident as described and depicted in Indian Vedic Legends.